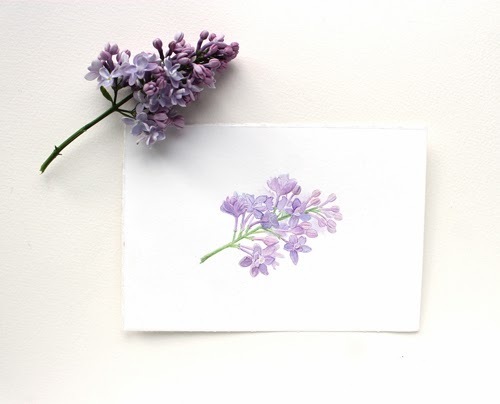 Last night, a customer bought my 'Lilac Sprig' original watercolour as well as a 'Ladybug' print on Etsy. Selling an original always brings mixed emotions. I've talked about this before and other artists have said the same thing--it can be hard to decide to put originals on sale. They are part of us. It's especially hard when it is a painting we are really happy with like this one. On the other hand, a drawer full of paintings that aren't shared with anyone doesn't make much sense either. I've sold many originals over the years and always deal with a tug at my heart when I do it. Some I hold on to longer than others. I also think it's important to keep some. I painted this one last May using a sprig from my garden as a reference (not the same sprig that's at the top of the photo but very close). I used beautiful handmade paper from Twinrocker. I had tears in my eyes when I saw the sale yesterday: happiness at having my art connect with someone, sadness at having to say goodbye to a loved painting. I can absolutely relate but how wonderful to have someone fall in love with one of our paintings enough to want to hang it in their home! So special! Love your work. It all makes sense in that moment doesn't it? You know exactly what I mean. :) Thanks so much for your kind words, Carol. I understand this double-edged feeling, so much. It means a lot to me to know my artwork is going to a home where it will be enjoyed and displayed thoughtfully. Your paintingd are delightful. It's helpful to know that we all feel this way. It makes a difference to know that our work has connected with someone and that it has meaning for them. Thank you, Cathy, for your kind words about my paintings. I think your work is wonderful. I think surrounding yourself with the art of friends and creative people you would like to be friends is form of kinship. Your art is beautiful like you . What a lovely way to look at it. Thank you for your beautiful words, my artist friend. I do so love lilacs and this is beautiful! where on earth did you find a real lilac now? Their smell is so heavenly! I painted this last May and took the photo then. :) I can't wait for my lilacs to bloom again. I love them too!